The Mounted Sentry Quad fume extractor is an effective choice for operations that support multiple work tasks in a single area. 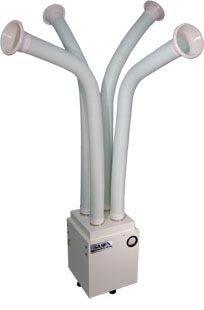 Each of this unit’s four self-supporting flex arms can be individually arranged to help protect workers from the respiratory hazards of co-located but individual operations, such as soldering, adhesive processing and packaging powders. This system’s strong fan pulls airborne contaminants into appropriate filter sets that capture both particles and fumes before they spread throughout surrounding areas. The included variable-speed controller manages an airflow rate of 10-85 CFM per flex arm. Sentry Air offers a variety of filter types, including HEPA filters [up to 99.97% efficient on particles 0.3 microns and larger], ASHRAE filters [up to 95% efficient on particles 0.5 microns and larger], Activated Carbon, and specialty-blended filter media for acid gas, mercury, aldehydes, and ammonia. This flexible dust and fume extractor can be mounted on, under, or above work benches and shelves, which frees up valuable floor space. This system is an ideal solution for workers located at the same bench but performing different tasks. Larger models [Model # SS-400-MSQ/SS-450-MSQ] provide airflow rates from 175-235 CFM for each arm at high speed. All models offer an optional 220-volt pigtail.